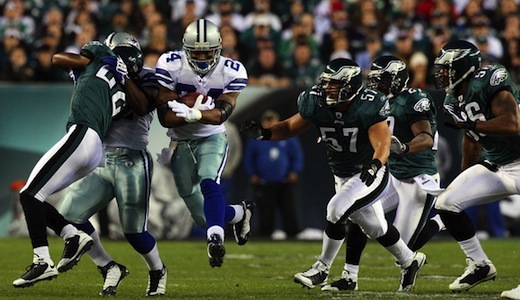 Coming into this NFL regular season, the Dallas Cowboys were thought to be the team to beat in the NFC East division as they were an extremely talented football team on both sides of the field, but even though America’s Team has come on as of late, the New York Giants and the Philadelphia Eagles are the only two teams left in the running for the division title. Ironically enough, the Eagles and the Giants were the two teams in the NFC East that were thought to be underachievers this season as Philadelphia got rid of six-time Pro Bowl quarterback Donovan McNabb and no one knew what to expect in New York as the Giants were just awful in the second half of last season. Fortunately, despite all the speculation and the changes to their franchises over the last two seasons, both of these teams are legitimate playoff teams right now and maybe even Super Bowl title contenders. Even though one of these teams might be Super Bowl bound this season, only one of them can win the division title this season and that will most likely be decided this weekend as the Eagles will travel to New Meadowlands Stadium to take on the Giants. Just a few weeks ago, the Eagles played exceptionally well against the Giants defending their home field in Philly as they came out with a convincing 27-17 and have been sitting in first place in the NFC East ever since. The emergence of NFL MVP candidate quarterback Michael Vick has been the main reason for the Philadelphia Eagles success this season, but even though Vick is getting all the attention right now, he wouldn’t have been able to do it without Pro Bowl wide receiver DeSean Jackson and up-and-coming running back LeSean McCoy. With these three players seemingly Pro Bowl bound this season, the Eagles have been flying high and seem like the team to beat in the NFC Conference behind Matt Ryan’s Atlanta Falcons, but they will have their work cut out for them this weekend as all the pressure will on them to come out on top against their division rivals. Even though a lot of people have considered the Eagles to be one of the top three teams in the league this season, they will come into this NFC East showdown as -3 point underdogs, but despite not being favored, I believe Michael Vick and company are playing at an extremely high level right now and should get the win and eventually the division title. The New York Giants may have one of the best defenses in the league coming into this game, but they stand no match for the potent offense of the Philadelphia Eagles as I believe there could be a blowout in the making.